Orangutan is pronounced orang-u-tan, as in suntan, not -tang. Orangutans are beautiful red-haired mammals who live in the rain forests of Borneo and Sumatra in the countries of Indonesia and Malaysia.In Malay orang means "person" and utan is derived from hutan which means "forest". 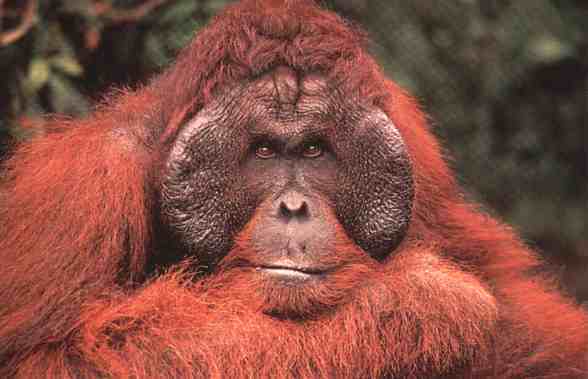 Thus orangutan literally means, "Person of the forest". Along with the bonobo, the chimpanzee, and the gorilla, the orangutan is remarkably similar to humans, in terms of anatomy, physiology, and behavior. Like the other great apes, orangutans are highly intelligent, as seen in their advanced tool use and distinct cultural patterns. Their native intelligence is often used to solve problems related to arboreal travel and food processing. However, their rainforest habitat is continuously being destroyed by illegal logging, mining, farming, and palm oil plantations. Despite formally protected status, the wild orangutan continues to be a critically endangered species and could soon become extinct in the wild. 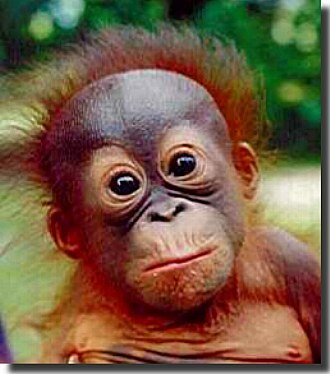 Experts predict wild orangutans could become extinct as natural populations in ten to twenty years. 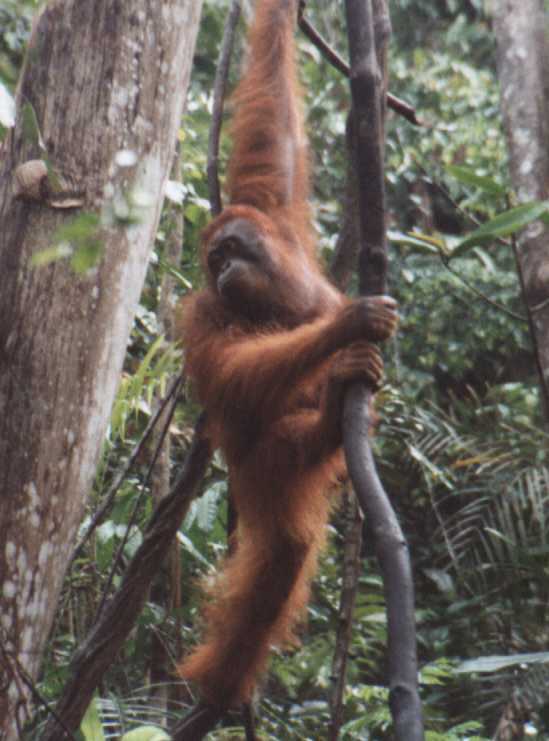 One species with two subspecies, one from SUMATRA (Pongo pygmaeus abelii) and the other from BORNEO (P. pygmaeus pygmaeus). The Borean male has large cheek pads, a tremendous laryngeal sac and a square shaped face. 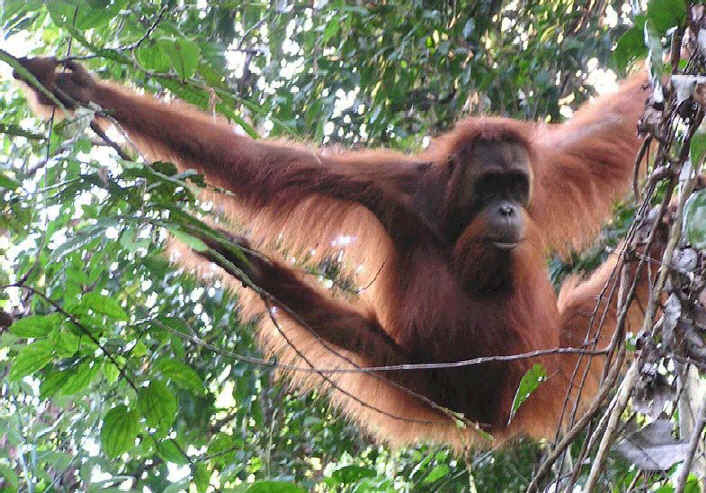 The Sumatran male has small pads and sac, a ginger colored mustache and a diamond shaped face. Individuals can also be distinguished genetically (DNA sequencing) or chromosomally (karyotyping). The world’s population of wild orangutans is to be found exclusively concentrated in the lush tropical rainforests of the islands of Borneo and Sumatra. The orangutan habitat has decreased by more than 80% in the last twenty years. 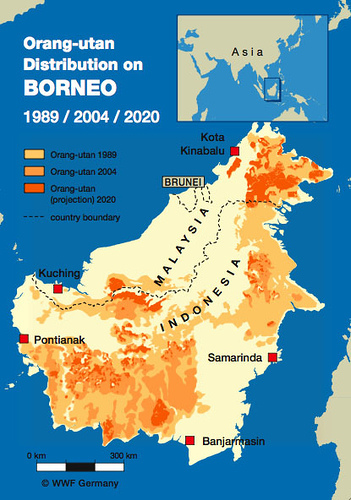 The areas most appealing to humans are often also those that are prime orangutan habitat - lowland forests. Commercial ventures from timber and oil to rubber and rice plantations destroy such vast tracts of land that orangutans are deprived of even the minimum use of resources they need to survive. Orangutans are classified as critically endangered; in the wild they are estimated to number between 20-30,000. Unless drastic measures are taken, orangutans will be extinct in the wild within 20 years.